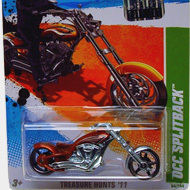 15/15 from the 2011 Super Treasure Hunt series. 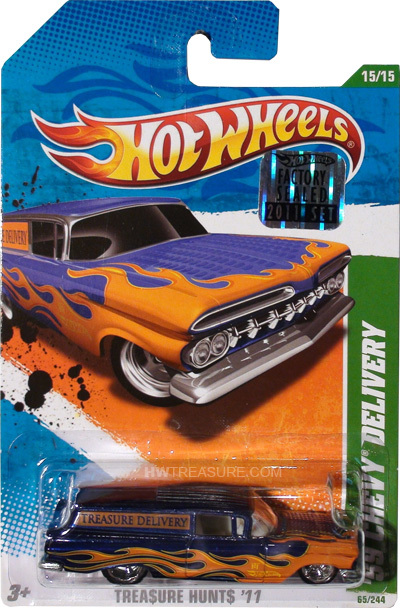 The Chevy has dark blue Spectraflame paint embellished with orange and yellow flames on the hood and sides, as well as “TH”, “TREASURE DELIVERY” and a yellow Hot Wheels logo on the sides. It has clear windows, a white interior, Real Rider 5-spoke mag-style wheels, and an unpainted metal Malaysia base.